Alembic Club: "Al-copy" Why not?!! hows about another fine one?? 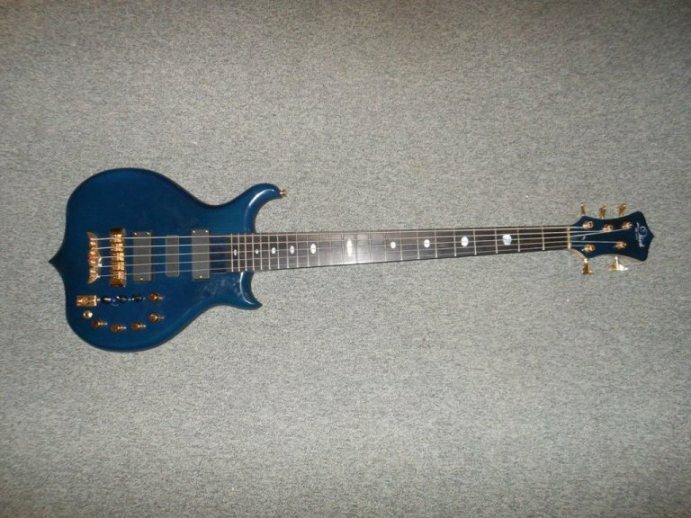 Looks like a cross between an Alembic and Status King Bass! This thread reminded me of an item buried deep in my closet. 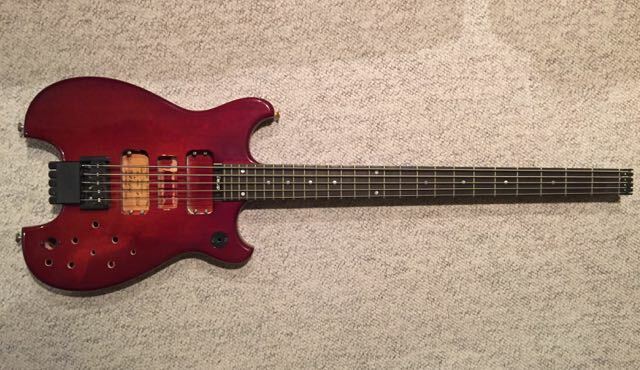 Built in '91 by Bill Delap (the guy making Holdsworth's guitars at the time) to fit Series electronics... It was an interesting experiment but sadly unsuccessful - at least for me. The strings felt like rubber bands and it was very difficult to turn those tuning pegs. Now the electronics are my spares on the road. Thought you'd enjoy the pic though. Thanks for the pic , I do enjoy it for a fact. I can relate as to the difficulty to turn such a variety of tuning pegs. " Strings felt like rubber bands" . I suppose the string tension was inadequate to the touch ? 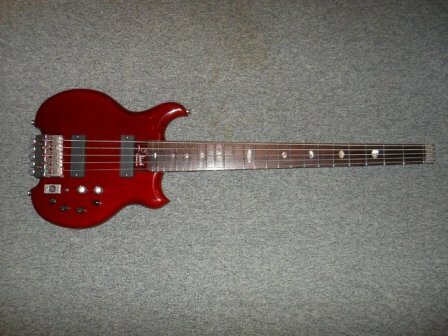 Where is the truss rod adjustment ? AXY pickups would fit that as well , is that correct ? Very interesting , my mind is tweaking with ideas. This looks like a fun project for the tweakings sake. My Yamaha BX1 is one of the best sounding bass guitars I own, but it's electronics may have been upgraded some. 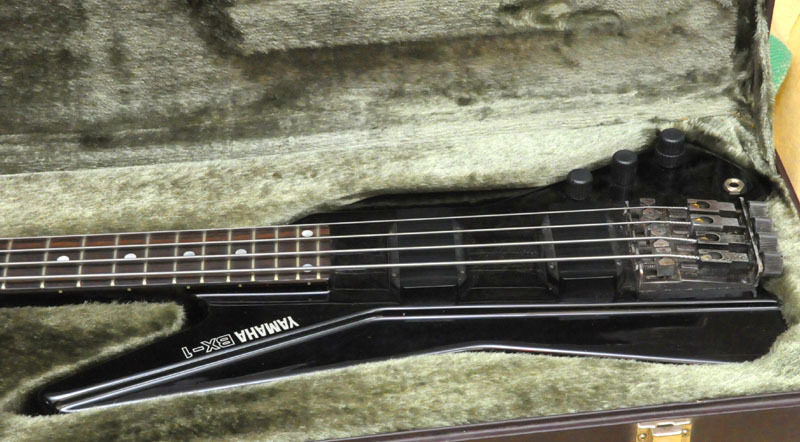 It has a small case and is one of the great under-rated bass guitars made. However, they all have a crack around the cord outlet. I think the wood was too thin on the body there. They are wood neck-throughs crafted out of beautiful wood that Yamaha then painted over, made around the era of the Steinberger basses. An Alembic that size would be great! I also have a BX-1. It's the bass I use when I need a fretted 4 string and for whatever reason I don't take my Alembic. Your knobs look non standard, I suspect you are right about an electronics change. The pickups look stock. These do have a tendancy to crack around the output jack. I wish I had another for parts. I used to also have a 5 string model (they were not made in Japan for some reason) and my 4 stringer sounded way better. I think it might have some EMG electronics in it. Everyone loves it in the cover band I am in, if I drag it to a gig. Totally 80's! I can't recommend upgrading the electronics enough. it makes this already nice bass sound amazing. okay,and whats about this fine blue grain? TOB, I hope this doesn't sound too rude, but why would anyone in the Alembic Forum be interested in these? Are you making these yourself, selling them from China, what's the deal? Best as I can see, the blue one's bridge is crooked, and it would have to be bogus pickups and electronics, as Alembic never sells Series electronics to other builders. So are you under the impression that it is Alembic who is manufacturing and selling these instruments outside of the US? That's an interesting idea, but I kinda doubt it. What is the brand name on these instruments? I can't quite read it in your pics. Anybody in the world can buy a genuine Alembic but they are expensive instruments even here in the US so importing them to another country would make them very expensive. I also can't see how many pins the cannon-type connectors on these basses have. If it's 5 or 4-pins, then perhaps it's a similar system to Alembic with an external power supply powering onboard preamps. But it might even be a 3-pin built in DI box, I can't tell. I don't think Alembic holds patents on the overall design of external power. There are many pieces of audio gear that do this, including microphones. But very few instruments. Anyway, there a saying: "imitation is the sincerest form of flattery". Alembic's creative design is bound to be copied to some degree by others because it is unique and brilliant. So some of this is to be expected. As board moderator, I thought it might be a good time to mention our posting guidelines. In social media and discussion boards on the internet, we can sometimes get a bit carried away when we're posting a comment or response; it happens. Many boards and comment areas have lax moderation and/or community standards, which can lead many to carry such lax standards to other boards. Here in the Alembic community, our standards include respect and consideration for our fellow club members and for our hosts, the Wickersham family and Alembic. We understand that people get upset in life; whether it's our workplace, family situation, love life, economics, etc, sometimes we just have a bad day, and it carries over into our other activities, including our participation in online communities. We live in a stressful world. Rather than add to that stress, I think it is to our benefit to do what we can to make our world a little bit better for everyone. This community exemplifies that ideal; and my expectation is that it will continue to do so. Thanks Dave , The mutual sentiment is extended . Dave, in our little corner of the world you often offer a remarably reasonable moment of Zen. Thank you for your perception and wisdom. Thank you Dave for working your magic; I would also like to commend Joey for showing great restraint after being provoked. I'm sorry. I understand the importance of being respectful to others but I believe strongly in the reciprocal relationship of that privilege. I do not see a single post where Woro introduces himself, as is customary when joining a forum such as this. Forgive me if I have overlooked one. Nor do I see any explanation as to what these basses are, as Joey had asked. Until then, his posts should be regarded as nothing more than spam. Hopefully he has been given a proper warning with an explanation that any similar future posts will result in his being banned from this forum.